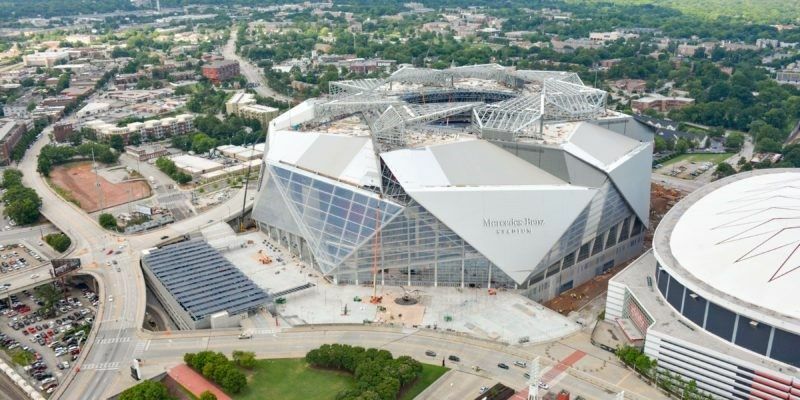 Atlanta’s newest Downtown resident, Mercedes-Benz Stadium, makes its debut in a big way as the most technically-advanced, fan-friendly event and sports venue in the U.S. The stadium not only serves as the home of Atlanta Falcons football and the city’s new Major League Soccer team, Atlanta United FC, but also includes concerts, private events and large meetings on its future schedule. Here’s the Mercedes-Benz Stadium 4-1-1. Visitors to Mercedes-Benz Stadium need not worry about having a bad seat while in the venue. If something impedes the view, just look up. A 360-degree, 63,000 square-foot halo video board adorns the top of the structure to give everyone a prime look at all going on below, including instant replays, scores and up-close shots of performers. This one-of-a-kind technology spreads to the stadium’s crowning jewel, an eight-panel automated “aperture” that transforms the stadium from closed to open in under 15 minutes. Other fan-friendly tech perks include high-speed Wi-Fi, digital signage and video displays throughout the facility. The stadium stays connected with an advanced fiber-based optical network, the first of its kind in the NFL. Mercedes-Benz Stadium’s guests experience the venue with a good time and good food. Local favorites and classic stadium fare occupy stalls serving everything from the new “fan-first” menus complete with $3 waffle fries and pizza, to Fox Bros. Bar-B-Q and Sublime Doughnuts. Molly B’s, named for owner Arthur Blank’s mother, joins the stadium’s offerings as an upscale dining option and features a carving station, raw bar and dessert table. The restaurant permits members-only through the first quarter and opens to all ticket holders at halftime. Fans itch to take a look inside the glass and steel structure, but the areas away from the field deserve a spotlight for a different reason. The art program at Mercedes-Benz Stadium, combined with the efforts of Savannah College of Art and Design, highlight more than 100 works commissioned from local and international artists. Drawings, photography and mixed-media pieces reflecting themes of Georgia history, the Atlanta community, football and soccer occupy everything from club and suite spaces to exterior plazas. The largest piece of the project, a 41-foot tall, stainless-steel falcon, greets sports enthusiasts and concert goers on the main plaza. The first time Mercedes-Benz Stadium becomes visible when traveling in the city, it makes an impression. From one-of-a-kind skyline views, endless areas to explore and dynamic guest experiences, Atlanta’s newest venue defies expectations.